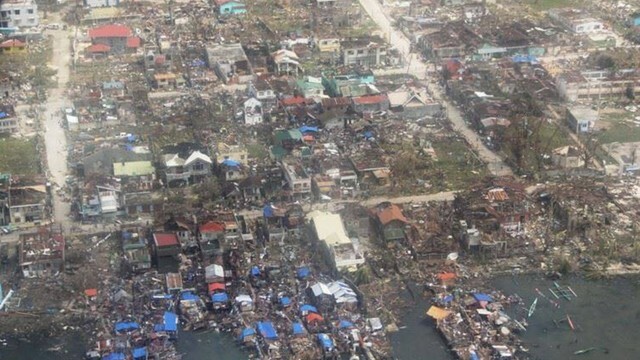 TACLOBAN, Philippines (AP) — The death toll from one of the strongest storms on record that ravaged the central Philippine city of Tacloban could reach 10,000 people, officials said Sunday after the extent of massive devastation became apparent and horrified residents spoke of storm surges as high as trees. About 300-400 bodies have already been recovered, Lim said. A mass burial was planned Sunday in Palo town near Tacloban. It weakened Sunday to 163 kph (101 mph) with stronger gusts as it approached central and northern Vietnam where authorities evacuated more than 500,000 people. President Benigno Aquino III said the casualties “will be substantially more” than the official count of 151 — but gave no figure or estimate. He said the government’s priority was to restore power and communications in isolated areas to allow for the delivery of relief and medical assistance to victims. The U.S. and other governments and agencies were mounting a major relief effort “because of the magnitude of the disaster,” said Philippine Red Cross chairman Richard Gordon. Even by the standards of the Philippines, which is buffeted by many natural calamities — about 20 typhoons a year, earthquakes and volcanic eruptions — the latest disaster shocked the impoverished nation of 96 million people. The airport in Tacloban, about 580 kilometers (360 miles) southeast of Manila, looked like a muddy wasteland of debris, with crumpled tin roofs and upturned cars. The airport tower’s glass windows were shattered, and air force helicopters were busy flying in and out at the start of relief operations. Defense Secretary Voltaire Gazmin said Aquino was “speechless” when he told him of the devastation the typhoon had wrought in Tacloban. The city’s two largest malls and groceries were looted and the gasoline stations destroyed by the typhoon. Police were deployed to guard a fuel depot to prevent looting of fuel. On Sunday, the city’s overwhelmed services were reinforced by 100 special police force units sent in from elsewhere to help restore peace and order. “On the way to the airport we saw many bodies along the street,” said Philippine-born Australian Mila Ward, 53, who was waiting at the airport to catch a military flight back to Manila. U.S. Marine Col. Mike Wylie surveyed the damage in Tacloban prior to possible American assistance. “The storm surge came in fairly high and there is significant structural damage and trees blown over,” said Wylie, who is a member of the U.S.-Philippines Military Assistance Group based in Manila. Tacloban is near the Red Beach on Leyte Island where U.S. Gen. Douglas MacArthur waded ashore on October 20, 1944, fulfilling his famous pledge, “I shall return,” made in March 1942 after President Franklin D. Roosevelt ordered him to relocate to Australia as Japanese forces pushed back U.S. and Filipino defenders. In the aftermath of the typhoon, people were seen weeping while retrieving bodies of loved ones inside buildings and on a street that was littered with fallen trees, roofing material and other building parts torn off in the storm’s fury. All that was left of one large building whose walls were smashed in were the skeletal remains of its rafters. “The sea engulfed Tacloban,” he said, explaining that a major part of the city is surrounded on three sides by the waters between Leyte and Samar islands. Tim Ticar, a local tourism officer, said 6,000 foreign and local tourists were stranded on the popular resort island of Boracay, one of the tourist spots in the typhoon’s path. U.N. Secretary-General Ban Ki-moon offered his condolences and said U.N. humanitarian agencies were working closely with the Philippine government to respond rapidly with emergency assistance, according to a statement released by the U.N. spokesperson’s office. UNICEF estimated that about 1.7 million children are living in areas impacted by the typhoon, according to the agency’s representative in the Philippines Tomoo Hozumi. UNICEF’s supply division in Copenhagen was loading 60 metric tons of relief supplies for an emergency airlift expected to arrive in the Philippines on Tuesday. The storm’s sustained winds weakened Saturday to 163 kph (101 mph) with stronger gusts as it blew farther away from the Philippines toward Vietnam. Haiyan was forecast to hit central Vietnam’s coast on Sunday afternoon, making its way to the northern part of the country before likely weakening to a tropical storm. “The evacuation is being conducted with urgency,” disaster official Nguyen Thi Yen Linh said from central Danang City, where some 76,000 were being moved to safety.